Smooth like a baby's bottom, consumer products giant Kimberly-Clark (NYSE:KMB) declared this week that it will pay a quarterly cash dividend of $0.81 per share on July 2 to shareholders of record at the close of business on June 7. That rate is the same rate it paid last quarter when it raised the dividend more than 9% from its prior level of $0.74 per share. Kimberly-Clark has increased its dividend every year for the past 41 years, and 2013 marks the 79th consecutive year it has paid a dividend to shareholders. The new dividend annualizes to $3.24 per share and yields 3.1% at the closing price of Kimberly-Clark's stock on May 2. 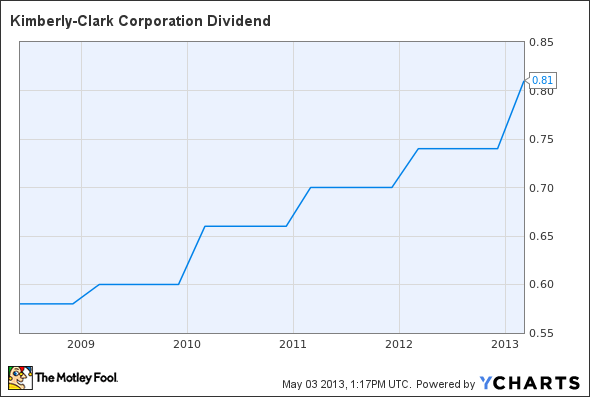 KMB Dividend data by YCharts.